Ever meet a real life superhero? Here’s your chance! A metabolic disease isn’t something that is for the faint of heart. Undergoing three hours of treatment every two weeks, Bentley has no choice but to stand strong. His wish was to go to the Florida theme Parks and meet his favorite superheroes! When he’s not saving the world you can find him playing soccer or building things with his LEGO® bricks. Asked what his favorite food is he replied, “Chick-fil-A and Poptarts!” To learn more about Bentley, click his picture and be directed to his Facebook page. There is a GoFundMe page also set up to help pay for his treatments that insurance doesn’t pay for! If you ever attended one of our events, you may have seen this guy riding in some of the cars. Nick was our very first wish kid at the first WW&W and he comes back to attend every year. Nick is diagnosed with a genetic disorder. 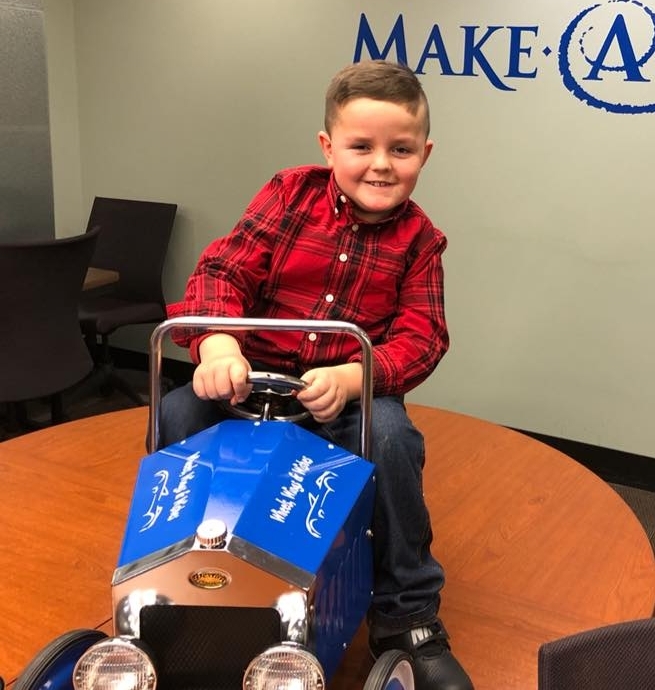 Make-A-Wish was able to send Nick and his whole family to the Florida theme parks for his wish. What’s his favorite thing to do at our event...Burnouts! Nick loves playing video games and playing outside. He recently started taking an interest in cooking and trying new foods! In fact he asked his mom if he could eat a whole jalapeno (which of course, she said no). Nick is a kid after my own heart because his favorite foods are wings, pizza, meat and potatoes. Jimmers is probably our most famous wish kid. From his story on ABC World News Tonight (click here) and Inside Edition, to being in the limelight for interviews and other fundraisers, Jimmy and his family are always on the move to give back. Speaking of moves, the J-man is a dancing machine. Before and after every treatment for his brain tumor, he would break out into a dance. His video of ringing of the bell to mark the end of his treatment went viral all over the world. Flag football, swimming, listening to music and collecting baseball cards are some of his hobbies. His favorite thing to do though is talking to people and asking them questions. The tumor won’t slow down his inquisitive mind! Chick-fil-A chicken nuggets don’t stand a chance on his plate at dinner time either! Check out his Facebook page here.